The Belmont Stakes is an American grade I stakes Thoroughbred horse race held every June at Belmont Park in Elmont, New York. 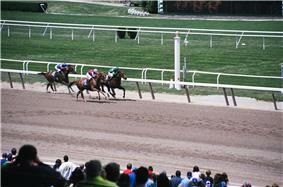 It is a 1.5 miles (2.4 km) horse race, open to three-year-old Thoroughbreds. Colts and geldings carry a weight of 126 pounds (57 kg); fillies carry 121 pounds (55 kg). The race, nicknamed The Test of the Champion, is the third and final leg of the Triple Crown and is held five weeks after the Kentucky Derby and three weeks after the Preakness Stakes, on a Saturday between June 5 and June 11. The 1973 Belmont Stakes and Triple Crown winner Secretariat holds the mile and a half stakes record (which is also a track and world record on dirt) of 2:24. The first Belmont Stakes was held at Jerome Park Racetrack in The Bronx, built in 1866 by stock market speculator Leonard Jerome (1817–1891) and financed by August Belmont, Sr. (1816–1890), for whom the race was named. The first race in 1868 saw the horse General Duke win, while the following year was won by Ruthless. The race continued to be held at Jerome Park until 1890, when it was moved to the nearby facility, Morris Park Racecourse. The winner of the Belmont Stakes is presented the August Belmont Trophy, one of the most prestigious trophies in the country. Near the end of the 1980s, winners of the Belmont Stakes were also entered into the Triple Crown series. The race remained at Morris Park Racecourse until the May 1905 opening of the new Belmont Park, 430 acres (1.7 km2) racetrack in Elmont, New York on Long Island, just outside the New York City borough of Queens. When anti-gambling legislation was passed in New York State, Belmont Racetrack was closed, and the race was cancelled in 1911 and 1912. The first winner of the Triple Crown was Sir Barton, in 1919. Since 1931, the order of Triple Crown races has been the Kentucky Derby first, followed by the Preakness Stakes, and then the Belmont Stakes. Prior to 1931, eleven times the Preakness was run before the Derby. On May 12, 1917 and again on May 13, 1922, the Preakness and the Derby were run on the same day. On eleven occasions, the Belmont Stakes was run before the Preakness Stakes. In modern times, the Belmont Stakes is held on the first Saturday that falls on or after June 5. The Kentucky Derby is always held on the first Saturday in May; the Preakness Stakes is held two weeks later; and the Belmont Stakes is held three weeks after the Preakness. The earliest possible date for the Derby is May 1, and the latest is May 7; the earliest possible date for the Belmont is June 5, and the latest is June 11. On June 9, 1973, Secretariat won the Belmont Stakes by thirty-one lengths, in a record time of 2:24, becoming a U.S. Triple Crown champion that year. His record still stands as the fastest speed for the Belmont Stakes. Count Fleet won the race by the large margin of twenty-five lengths in 1943. 1989 winner Easy Goer ran the second fastest time of 2:26. Easy Goer also holds a Beyer Speed Figure of 122 for the race, the best of any Triple Crown race since these ratings were first published in 1987. Affirmed was the last winner of the Triple Crown, taking the Belmont Stakes in 2:26 4/5 on June 10, 1978. Ridden by eighteen-year-old Steve Cauthen, Affirmed defeated rival Alydar with Jorge Velasquez in the saddle. At the time the race was the third slowest start and the third fastest finish with the quarter in 25, the half in 50, 3/4 in 1:14, the mile in 1:37 2/5. Belmont Park saw its largest crowd in its history when 120,139 people witnessed the Belmont Stakes in 2004 when Smarty Jones was seeking the Triple Crown but was upset by Birdstone. The largest crowd of the 20th century was in 1971 with over 80,000 people, supplemented by the city's Latino community, there to cheer on their new hero, Canonero II, the Venezuelan colt who had won the Kentucky Derby and Preakness Stakes and was poised to win the U.S. Triple Crown. However, due to a foot infection that had bothered the horse for several days, Canonero II failed to win the Triple Crown when he struggled across the finish line in 4th place behind Pass Catcher, ridden by Walter Blum. Despite this loss, Canonero II was named the winner of the first Eclipse Award for Outstanding Three-Year-Old Male Horse. The Belmont Stakes is traditionally called "The Test of The Champion" or "Run for the Carnations" because the winning horse is draped with a blanket of white carnations after the race, in similar fashion to the blanket of roses and black-eyed susans for the Derby and Preakness, respectively. The winning owner is ceremonially presented with the silver winner's trophy, designed by Paulding Farnham for Tiffany and Co. It was first presented to August Belmont, Jr. in 1896 and donated by the Belmont family for annual presentation in 1926. Despite the fact that the Belmont Stakes is the oldest of the Triple Crown races, its traditions have been more subject to change. Until 1996, the post parade song was "The Sidewalks of New York". From 1997 to 2009, the song was changed to broadcast a recording by Frank Sinatra of the "Theme from New York, New York" in an attempt to appeal to younger fans. In 2010, the song was changed to Jay-Z's "Empire State of Mind" before reverting to "Theme from New York, New York" from 2011 through the present. This tradition is similar to the singing of the state song at the post parades of the first two Triple Crown races: "My Old Kentucky Home" at the Kentucky Derby and "Maryland, My Maryland" at the Preakness Stakes. The change of song gave rise to “the myth of Mamie O’Rourke,” a reference to a character in the lyrics of "The Sidewalks of New York." Some claim that changing the official Belmont song "cursed" the Triple Crown and was why no horse had won since Affirmed in 1978. Others note that there was no Triple Crown winner between 1979 and 1996, even though "Sidewalks" was still played. Along with the change of song in 1997, the official drink was also changed, from the "White Carnation" to the "Belmont Breeze." The New York Times reviewed both cocktails unfavorably, calling the Belmont Breeze "a significant improvement over the nigh undrinkable White Carnation" despite the fact that it "tastes like a refined trashcan punch." 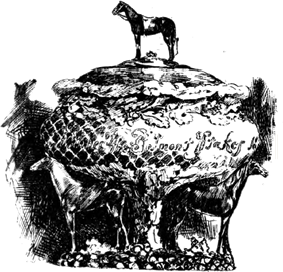 From 1986 until 2005, the Triple Crown television rights comprised a single package. In late 2004, the New York Racing Association withdrew from that agreement to negotiate independently. As a result of this NBC, who was the rights holder for all three events, was only able to keep its broadcast rights to the Kentucky Derby and Preakness Stakes. ABC regained the rights to the Belmont Stakes as part of a five-year contract that expired following the 2010 race; NBC has since regained the rights to the race. 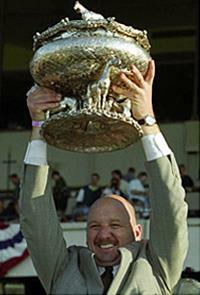 Kenny McPeek - 2002 Belmont Stakes G1 win with Sarava, who at odds of 70–1, upset War Emblem's bid for the Triple Crown. Only George M. Odom have won the Belmont Stakes as both jockey and trainer. Three fillies have won the Belmont: Ruthless in 1867, Tanya in 1905, and Rags to Riches in 2007. By comparison, three fillies have won the Kentucky Derby. On average, fillies have won between 2% and 3% of the Triple Crown races, with similar numbers for geldings; while about 95% of these races have been won by colts. Note: Timed to the 1/4 second 1867 to 1901 and 1903, to the 1/5 second 1902 and 1904 to 2001, then to the 1/100 since 2002 as well as in 1992. ^ "Viewership of 2008 Belmont Stakes". ^ a b c "Belmont Stakes Records & Traditions". New York Racing Association. Retrieved 2011-11-04. ^ "Preakness Stakes". Turfnsport.com. Retrieved 2010-10-07. ^ The Associated Press (June 4, 2010). "The Belmont Stakes singing a new tune". newsobserver.com. Retrieved June 19, 2012. ^ The Associated Press (June 4, 2011). "Sinatra’s voice returns to Belmont Stakes". boston.com. Retrieved June 19, 2012. ^ Dandrea, Phil. Sham: Great Was Second Best. Acanthus Publishing.